(Woodstock, NY) Sept. 25, 2011: The 12th Annual Fiercely Independent Woodstock Film Festival wrapped Sunday night with a record number of premieres from all over the world, record number of filmmakers and attendees. Film lovers attended nearly 150 films, concerts, panels and special events in Woodstock, Rhinebeck, Rosendale and Kingston, in NY's Hudson Valley. 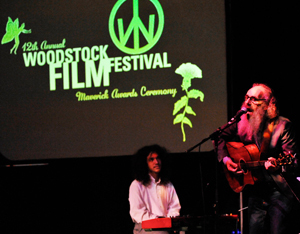 Saturday night's Award Ceremony featured a surprise musical "acceptance speech" from 2011 Honorary Maverick Award recipient Tony Kaye, whose film Detachment closed out the festival. "We've had an incredible year of spectacular films and innovative filmmaking," said WFF Executive Director and Co-Founder Meira Blaustein. "It doesn't seem possible to keep getting better every year, but it does! We want to thank all the filmmakers and audiences for making this another fantastic season of independent film. On a personal note, seeing our Maverick recipient Tony Kaye whip out his guitar on stage and play with Paul Green's Band of Monkeys was a definite first, and another example of why we gave him the Maverick Award!" Other veteran directors with screenings at WFF included Bruce Beresford, Jonathan Demme, Nancy Savoca and Susan Seidelman. On The Ice, directed by Andrew O. MacLean received The Lee Marvin Award for BEST FEATURE NARRATIVE. Honorable Mention went to Tilt, directed by Viktor Chouchkov Jr.
Semper Fi: Always Faithful, directed by Tony Hardmon & Rachel Libert received BEST FEATURE DOCUMENTARY honors. Honorable Mentions went to Skateistan: Four Wheels and a Board in Kabul, directed by Kai Sehr and Dolphin Boy, directed by Dani Menkin and Yonatan Nir. THE SHOW MUST GO ON AND IT DID! Wednesday's Kick-Off Concert at the Bearsville Theater went off without a hitch, in spite of a transformer blow-out that blacked-out much of the town of Woodstock, including the Bearsville Theater. The WFF concert team, headed up by new Music Director Paul Green, and assisted by enthusiastic community members, transformed the darkened theater into an intimate, candle-lit cabaret. Power was eventually restored and the show transferred back to the big stage to the cheers of hundreds. A record of 62 Premieres consisting of 19 World Premieres, 4 North American Premieres, 5 U.S. Premieres, 13 East Coast Premieres and 21 New York Premieres. OPENING NIGHT FILM: U.S. Premiere of Bruce Beresford's Peace, Love and Misunderstanding. CLOSING NIGHT FILM: Tony Kaye's Detachment. Presenters and special guests included Ellen Barkin, Mark Ruffalo, Vincent D'Onofrio, Tim Blake Nelson, Timothy Hutton, Tony Kaye, Debra Granik, Barbara Kopple, Fisher Stevens, John Sloss, Ellen Kuras, Stephen Nemeth, Bill Plympton, Chris Wedge, Lori Singer, Jonathan Gray, Sabine Hoffman, Hugo Perez, Robin Bronk, Bruce Beresford, Meera Gandhi, Susan Seidelman, Nancy Savoca, Michael Silberman, Bingham Ray, Richard Abramowitz, Signe Baumane, Doreen Ringer Ross, Larry Fessenden, Ron Mann, John Ventimiglia, Michael Imperioli, Sara Driver, Alex Steyermark, Thelma Adams, David D'Arcy, George S. Clinton, Michael Bacon, Noah Hutton, Lisa Gossels, Philippe Quint, Nellie McKay, Javier Limón, Cristina Pato, José Manuel Zapata, Tracy Bonham, Jerry Marotta, Betty, and many other outstanding luminaries of indie film. Mark your calendars WFF 2012 Dates October 3-7! See you then. Hailed by Indiewire as "A true American Maverick Among Fests" and praised by actor Ethan Hawke as "among the finest of a dying breed: a festival that isn't trying to sell you anything, but simply and beautifully celebrating the art & craft of filmmaking", the Woodstock Film Festival premiers exceptional films, hosts the most talented emerging and established professionals in the movie industry; presents A-list concerts, panels and parties, and creates stimulating, innovative programming year-round. The Woodstock Film Festival is a non-profit, 501 (C)(3) with a mission to present an annual program and year-round schedule of film, music and art-related activities that promote artists, culture, inspired learning and diversity. The Woodstock Film Festival celebrateded its 12th Annual Festival September 21- 25, 2011, with an extraordinary line-up of fiercely independent films, panels, concerts and special events in Woodstock and the neighboring towns of Rhinebeck, Kingston and Rosendale.